The man who, among many other achievements, inspired two television programmes, Big Brother and Room 101, and painted a chilling dystopian portrayal of a totalitarian state in his novel Nineteen Eighty-Four, also unofficially provided the blueprint for many of the pubs in modern Britain. George Orwell was an influential essayist as well as a novelist (indeed, the Orwell Prize is an annual award, set up in his honour, for the best piece of non-fiction published each year), but one of his less famous essays was ‘The Moon under Water’, a short piece published in the London Evening Standard in February 1946. Perhaps most importantly of all, they ‘never … make the mistake of serving a pint of beer in a handleless glass.’ One wonders what Orwell would make of most modern British pubs, where the norm has become straight, handleless glasses rather than the tankard glasses which were an English icon for much of the twentieth century. Orwell was born Eric Arthur Blair in India in 1903, and formed his more famous pen name by joining the patron saint of England (and the monarch of the time, George V) with the river Orwell in Suffolk. The idea was to create a typically English-sounding name. Orwell introduced a number of words and phrases into the language, including Big Brother (for constant surveillance by the state), thoughtcrime, thought police, and doublethink (but not, as is sometimes claimed, double-talk – an earlier, American coinage). His second most-famous book, Animal Farm, almost never made it to print: the manuscript only narrowly avoided destruction at the hands of the Nazis when London was bombed in the early 1940s, and then a number of leading publishers – including T. S. Eliot, editorial director at Faber and Faber, who had been working alongside Orwell at the BBC during the war – refused to touch it. 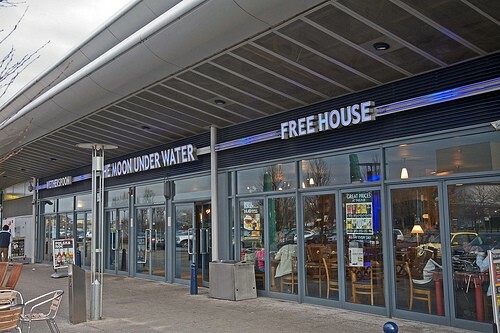 Fourteen Wetherspoon pubs around the UK bear the name The Moon under Water in honour of Orwell’s essay: there are branches in London, Manchester, Wolverhampton, Watford, and Milton Keynes, among many others. The founder of the chain, Tim Martin, formed the name of the chain JD Wetherspoon by combining the name of a character from the television series The Dukes of Hazzard with Mr Wetherspoon, one of Martin’s old schoolteachers who allegedly wrote in his school report that he would ‘amount to nothing’. We have more interesting George Orwell facts here.